When drowning in the appropriate sound, you find yourself achieving the same fundamental effects in your soul as coming up for air has on the body. Caspian is that appropriate sound. An instrumental rock band from Beverly, Massachusetts formed in autumn of 2003; these four young men have crafted a sound that is immediately riveting, emotionally devastating, and achingly passionate. 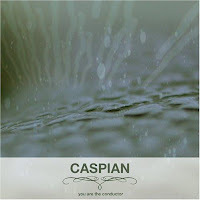 Characterized by towering walls of sound, oceanic guitar work and vicious rhythmic elements, Caspian is a band that knows how to imbed itself within the part of you that refuses to easily surrender. Take a walk around the bands home co-ordinates and you might find some clues. Tan stretches of sand and the infinite blue horizon of the Atlantic might be bigger influences here than anything else. The jam packed seasonal cycle might explain the bands desire to cover everything from gentle and placid to furious and destructive, all while maintaining a unified musical sensibility, and a fierce sense of adventure . Live in an area like this and you’re bound to create something hopeful, inspiring and downright massive. Caspian wants to bring you to places like this and to places we all haven't seen yet. Let them take you. I recently downloaded this album, and after the first few listens, it didn't really stand out to me as anything different, but just another post-rock album. After some more careful listens, this album is one of my top favorites. The last couple minutes of the last song is what I imagine you'd hear when ascending to heaven, and I'm agnostic. I've been looking everywhere for this. Thank you so much!